Thanksgiving is truly one of the best holidays ever! It’s ALL about the food. But all that feasting can really wreck havoc on all the hard work you’ve done eating healthy all year. So, this week, I’ve decided to share some of my favorite Thanksgiving recipes, made-over to have less calories and fat but still taste delicious. 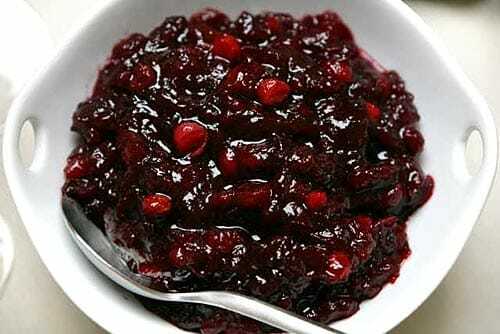 The first in my series of Thanksgiving delights is this amazingly good Weight Watchers Cranberry Sauce recipe. With just 1 Weight Watchers Point per serving, you don’t need to feel any guilt about indulging in this tasty, low calorie cranberry sauce recipe! Give it a try and serve it up on your Thanksgiving table this year. In a medium sized pot, combine water, sugar, and Splenda over high heat until sugar and Splenda have dissolved. Then add bag of cranberries and dash of cinnamon and bring to a boil. When cranberries start to “pop”, stir gently and remove from heat. Transfer cranberry sauce into serving dish and place in fridge to chill. I added the zest of an orange to the cooking process. I removed the orange zest when the sauce was done. Delicious!!!! Where does the Nutmeg come in? How many servings does this particular recipe yield? Total recipe makes about 8 servings. Enjoy! In med sized pot, combine water, sugar, and Splenda over high heat until sugar and Splenda have dissolved. Need to know how much water to combine with sugars. Thank you. I am totally making this dish Thanksgiving! Thanks for posting!